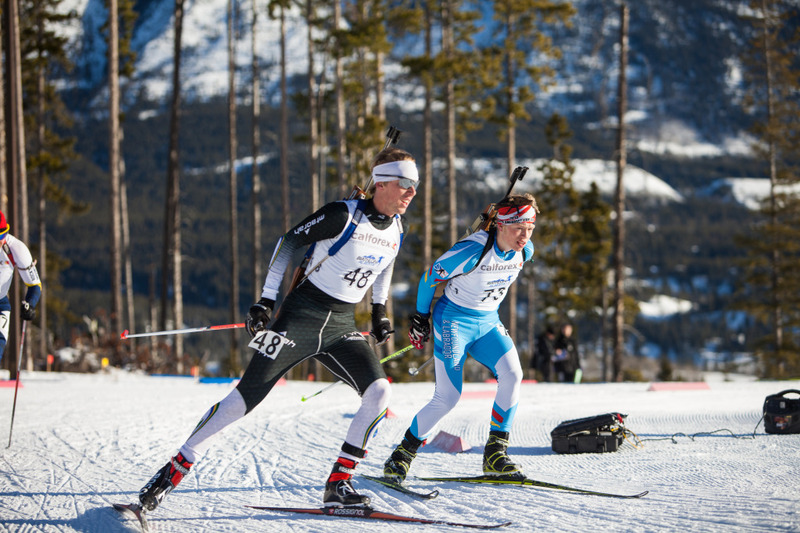 Far West Nordic Ski Racing 2015 – Ready, Set Go! The men’s 10k and the women’s 5k distances were USSA-sanctioned races and Junior National Qualifier’s for juniors from the Far West, with lots of great competition. In addition the men’s 5k was also a JNQ race for boys under age 16. The Snowshoe Thompson a fun interval start race, with competitors starting 30 seconds apart. That means no one really knows who has won until everyone is done racing. The athletes have to work extra hard to push themselves because their competitors are often out of sight, but they also have to pace themselves because it is easy to get anxious and go too hard too early. This year, the men’s 10k was won by Patrick McElravey, a former Far West junior, now skiing for Middlebury College, with an impressive time of 33:11.5. In second place was the Far West Elite Team’s Spencer Eusden, followed by Shane Christian of Bridger Ski Foundation. The women’s 5k was won by 2013 NCAA champion Joanne Reid with the incredibly fast time of 17:40.3. Sugar Bowl Academy’s Hannah Halvorsen was seven seconds back in second place, and in third was the Far West Elite Team’s Emily Blackmer. The 10k women’s race was won by Beth Reid with a time of 38:48.6, good for 19thoverall in the 10k distance. Carolyn Tiernan took home second place and Beth Thomas finished in third. Sam Shoderbek from PNSA won the men’s 5k with a time of 18:32.2. Haydn Halvorsen of Sugar Bowl Academy finished in second, just 12 seconds behind and JC Schoonmaker of Tahoe XC came in third. There was a shorter youth division that was won by Natalie Lang-Ree, who managed to beat out all of the boys and finished in just 6:34.1. The Showshoe Thompson Cup, won by the fastest participants (male and female) over 60, was won by Russell Reid and Caroyln Tiernan this year. The youngest racer on Sunday was just four years old and the oldest racer was Frank Sarnquist at 72 years old. There were many college racers home for the holidays to participate in the Snowshoe Thompson, including 10k winner Patrick McElravey, Laurel Fiddler (Bates), Bria Riggs (Bates), Joelle Romo (MSU), and Austin Meng (St. Lawrence). The Far West Elite team also posted some great results. In part because of the participation of these older, more accomplished racers, all athletes were able to earn good USSA points. Another factor in the great points available in this year’s Snowshoe Thompson was the participation of junior racers from teams all around the Pacific Northwest Ski Association (Far West’s regional neighbor to the north). Some of these teams drove as much as 15 hours to compete, and their presence helped make the day so much fun! Auburn Ski Club is very thankful for its race sponsors. The Snowshoe Thompson was sponsored by Silver Sage Center in Reno, NV. Silver Sage’s support made this race possible and the ASC Training Center is especially thankful for their generosity. In addition the Snowshoe Thompson is supported by Hammer Nutrition and by Salomon,Swix and Fischer. ASC would like to extend a huge “thank you” to all the sponsors for helping to make the Snowshoe an amazing event. http://silversagecenter.com/wp-content/uploads/2014/12/snowshoe.jpg 1800 1200 julieyoung http://silversagecenter.com/wp-content/uploads/2014/06/SS_14171-Logo-Development-SportsLab-Horz-header-300x83.png julieyoung2014-12-29 07:41:482014-12-29 07:41:48Far West Nordic Ski Racing 2015 - Ready, Set Go! In two previous posts we discussed who can benefit from testing and what tests are available and what they deliver. To read part I, click here, to read part II, click here. Today we offer our thoughts on the value of testing. Part III – Why Test? 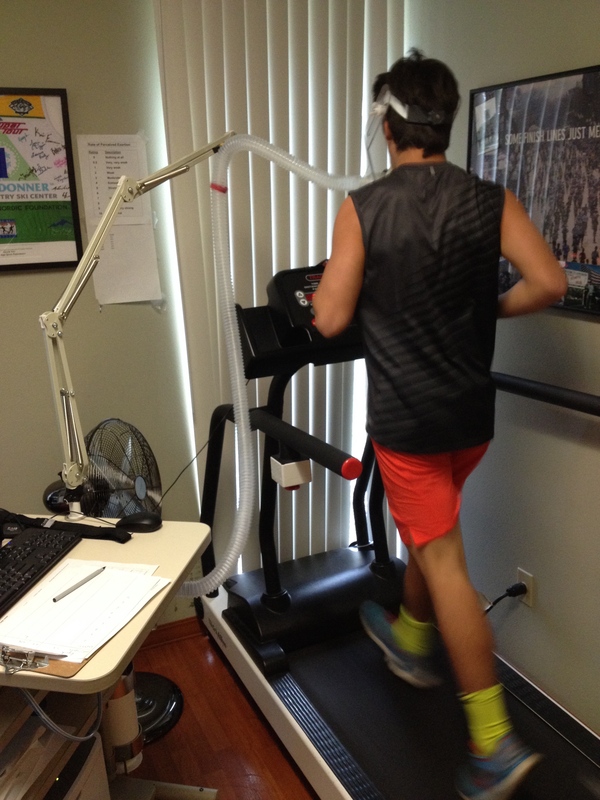 Physiologic testing provides invaluable understanding to empower athletes and improve their training. Often, we find that it’s the person relatively new to exercise who often benefits the most from testing. Through the testing process, athletes gain a deeper understanding of how the resulting individualized training zones connect to their unique fitness goals. This information can take an athlete from unproductively and mindlessly going through the motions to purposeful, motivated daily workouts. Testing helps the athlete, from recreation to elite, avoid common training pitfalls and optimally focus each day’s workout toward achieving the ultimate goal. As a result of testing, individuals learn and understand the importance of quality intensity and quality rest, and incorporating variety in to the weekly training plan. Many recreational and master athletes have a limited time frame for exercise and do the same activity at the same intensity, every day. We all know that person who diligently runs for 30 minutes and is mystified why he/she is not experiencing fitness gains and results. Successful training plans – at every level – are based on gradual progression and systematic variety of elements relative to each individual’s current fitness and future goals. A well-structured training plan utilizes an individual’s training zones to develop a program that progressively stresses/challenges the body’s central (heart and lungs) and peripheral (skeletal muscle) components, while countering the work load with rest and recovery. This plan reduces plateaus and achieves continual fitness gains. Physiologic testing provides the tools to help us educate our clients on the importance of quality intensity (at varying intensity levels) and quality rest, guided by the testing derived heart rate/power zones to deliver effective results. 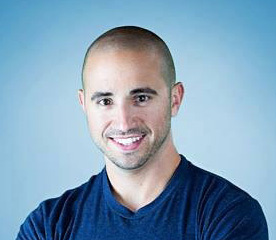 Andy Pasternak established and owns Silver Sage Center for Family Medicine, as well as Silver Sage Sports and Fitness Lab. Julie Young is the Director of Silver Sage Sports and Fitness Lab and owner/head coach-performance trainer at o2fitness Coaching and Training. Life’s too short to not enjoy cross-training! I love how Julie says, this time of year, do what you love, mix it up, enjoy those cross-training-endurance days! I have snowshoed a bunch since the beautiful white stuff has started falling in our area. It’s such a great workout for the lower body. I can really feel it in my quads, glutes, hips, and even in my abs/core. When I snow-shoed last year I experienced sharp pain in my left hip. Not this year! The off-the-bike training from Julie has seriously helped my hip strength and flexibility. 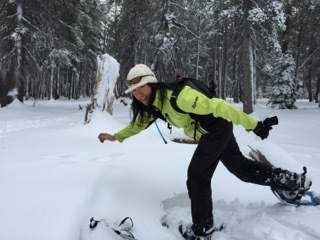 I am now able to snowshoe 5 miles including steep ascends, pain-free! And with the constant reminder from Julie to “engage our core”, my abs also get a great workout. All of this cross-training and off-the-bike fun is not only helping my hip joints and muscle strength now, but it is also creating super fun times with my teammates. That to me is priceless! http://silversagecenter.com/wp-content/uploads/2014/12/IMG_0221.jpeg 240 320 julieyoung http://silversagecenter.com/wp-content/uploads/2014/06/SS_14171-Logo-Development-SportsLab-Horz-header-300x83.png julieyoung2014-12-22 06:19:072014-12-22 06:21:10Life’s too short to not enjoy cross-training! The injured runner and running injuries – what a conundrum! A while back I had become increasingly frustrated by what seemed, a lack of science-based treatment plans for the injured runner. There also seemed a void on how to systematically return runners to sport, and prevent injuries. Running magazines, blogs and books seemed to exacerbate the confusion, by presenting the flavor-of-the-day solutions, leading readers on a zig-zag course based on quick fixes and sweeping technique changes. In my frustration, I started researching programs that offered science-based solutions to assessing, evaluating and returning runners to sport, as well as strategies to prevent injuries. As a result, I decided to commit to a six month fellowship on Advanced Lower Extremity Biomechanics with Dr. Chris Powers, at his USC-affiliated Movement Performance Institute in Los Angeles. In short, Dr. Powers had his ah-ha, research-changing moment when the MRI became dynamic in its capability, and able to capture movement. Powers captured the movement of a single leg squat, and proved, in very simple terms, that hip stability dictates the hip, knee, toe alignment. This turned physical therapy regarding treatment of knee issues upside down. Up to this point much of the treatment had been focused on strengthening the muscles directly surrounding the knee in order to improve knee alignment relative to the hip and toe. Fifteen years of research, focused on better defining the hip-lower extremity relationship, later, Dr. Powers has derived a research proven assessment, dynamic (video) evaluation, treatment and return to sport protocol. Powers’ systematic, progressive protocol contrasts with the prevalent treatment which seems often based on a shot-gun, guess-work approach in attempting to solve the mystery of the injured runner. Recently, now a few years after completing the Power’s fellowship, I attended a research symposium, entitled the Science of Running. This was a unique opportunity to hear three of the leading researchers and clinicians present on normal and abnormal running biomechanics, assessment, evaluation, and treatment of the injured runner. While all three agreed on most of the points presented, with slight degrees of variation in assessment and evaluation, they were oceans apart in their treatment strategies for the injured runner. Hmmmmm, Interesting. Dr. Irene Davis, on faculty at Harvard Medical School and Director of the Spaulding National Running Center, who treats runners by transitioning them to a forefoot strike, in minimalist shoes or barefoot. Dr. Brian Heiderscheit, Professor at the University of Wisconsin, Madison, and Director of the Runner’s Clinic at UW Sports Medicine Center and Director of Badger Athletic Performance Research, treats injured runners through cadence manipulation, shortened stride and moderate heel strike. Dr. Chris Powers, Co-Director of the Musculoskeletal Biomechanics Lab at USC, and Director of the Movement Performance Institute, treats with improved hip activation/recruitment and stability with a heel strike pattern. This was a unique opportunity to glean from three leading researchers, who implement what they have proven in their research in to practice with patience in their clinics. So these are research proven, patient tested protocols and strategies. I was motivated and interested to attend the symposium to hear and understand all sides of the foot-strike story. We all know there is not a one-size fits all, technique. But I wanted to deepen and widen my understanding of the underlying issues in order to help runners, run pain free, and avoid injury. This post will be the first in a series, sharing the 30,000 foot view (avoiding too much detail to bore you to delirium) of the Science of Running symposium. My results were pretty cool to read and super eye opening. I efficiently metabolize fats at a heart rate of 122-147, which is amazing to know during our strenuous workouts. Even cooler, I found the speed at which I transfer from burning carbs to burning fat, great for the days I am looking to get a good burn on. I am sure you are asking, “What good does this do?” TONS!!!! If you are looking to be the most efficient than you have ever been, burning fat, being productive in your workouts, and truly becoming the most effective athlete you can be, this is the true key to fitness and endurance success. There is no pill, no special pink drink, and no ridiculous calorie restrictions…there is the Metabolic Efficiency Test. The heart rate I told you about (122-147) is the sweet spot for my fat burning. The graphs break it down in different ways based on speed or heart rate, or percentage of fat being burned compared to carbs. If you focus on the blue line, fats, and focus on the area in each graph where that line stays more constant in the middle, that is my key fat burning zone. Where it drops off is where I then start relying more on carbs. So the key is to stay diligent on those prescribed endurance days, so that I am gleaning all of the benefits of developing the capillary and mitochondrial densities, in addition to training the body to become more efficient utilizing its energy stores. 1. For those endurance athletes looking for performance, this is key. It is a fallacy to think you can replace the calories you are expending, and often times, in ultra running events, food intake leads to GI distress and proves to be one of the greatest limiters to performance. So if these athletes can better train their bodies, through proper endurance training coupled with proper nutrition, to utilize existing fuels it is advantageous. This type of met efficiency training is best trained in the off-season. 2. For those looking to lose weight, the metabolic efficiency test provides that baseline caloric intake need to keep organs healthy, and the met efficiency provides the sweet spot in fat metabolism. As individuals stay diligent in training in this zone they not only improve fat metabolism, but they will extend this zone out and be able to use fats for energy at higher intensity levels. The knowledge I received from this test will forever be locked in my brain, nagging (in a good way) at me, telling me where I need to be and how I need to get there. I feel as if I now have the key, the key to absolute success with any of my fitness goals. At this point it is up to me to make the necessary changes and move forward, unlocking my true potential. December racing has taken the Elite Team across the globe. After the season openers in West Yellowstone, Sabra, Emily and Spencer traveled to Bozeman, MT for a second weekend of SuperTour racing. The Bohart Ranch course is known for its long, steep uphills and technical downhills, a killer combination that quickly made clear who has the best early-season fitness. Our crew is not aiming to peak in the early season, and as a result we are still working into the type of max-effort fitness required to hammer up those big hills. With more hard intensity efforts, in training and in the upcoming races at Auburn Ski Club, our “race shape” will continue to improve – just in time for US Nationals in early January! 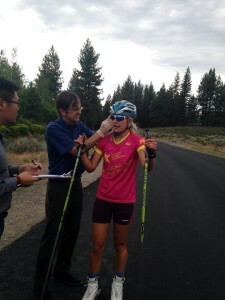 Anja didn’t accompany the rest of the group to Bozeman because she went to Europe to race the OPA Cup, which is analogous to the US SuperTour: the leader of the race series qualifies for World Cup starts. Unfortunately, it turns out Europe is pretty low on snow and qualifier races and the first OPA Cups were canceled. Luckily, Anja was able to race a Swiss Cup instead of first OPA Cup and was happy to end up in 3rd place and 1st German. Patrick Johnson spent Thanksgiving in Canmore, Alberta training and preparing for not only his first races of the season, but also his first biathlon races ever! The 10km sprint and 15km mass start race in Canmore were the largest ever biathlon races in North America, with over 300 competitors. After only missing four targets in the sprint, Patrick ended a very respectable 5th place. He ski time for the mass start was also great, but there is significantly more shooting in a 15km – a disadvantage for a novice biathlete. Excited about the start to his season, Patrick is now in Minnesota racing the IBU Cup trails and hopes to keep improving his shooting! Part II – Which Tests are Available? The RMR determines an individual’s basic daily caloric requirements. It also indicates how your body uses fats and carbohydrates for fuel at rest. RMR testing is especially relevant for individuals interested in maintaining or losing weight. Lactate threshold testing is done by obtaining a small sample of blood while exercising at increasing intensity. Once we graph your individual data, we can then help you determine your heart rate zones and speed as you train to meet your goals. This test is also our favorite way to demonstrate the effectiveness of your exercise program in improving your fitness. While the LT and Vo2 tests can be administered individually we believe it is often beneficial to couple these tests to provide the most definitive data. Below is a collaborative piece based on an ongoing project between Silver Sage Sports and Fitness Lab and the developers of TrainerRoad software. We wanted to see how deriving threshold via lactate and power compared, contrasted and ultimately how the numbers stacked up. 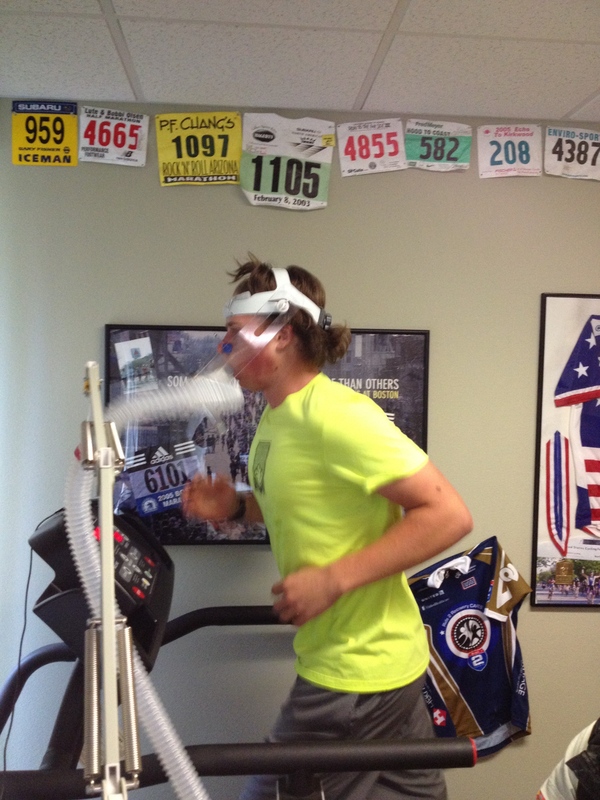 Recently, Chad and Reid from TrainerRoad performed lactate tests at Silver Sage Sports and Fitness Lab. All of our TrainerRoad workouts are based upon Functional Threshold Power. While this value is ideal for power-based training, we wanted to dive in deeper and explore this value a bit more. What causes it? What can we learn from it? What does it really mean? While many things may factor into these answers, one of the biggest is lactate. Lactate is the cause behind your pain when you’re grinding away at or above FTP. It is an acidic substance produced by skeletal muscles when they are no longer operating aerobically. It’s a very common product of endurance exercise, but when you’re really pushing your limits, the accumulation of lactate in your body is what forces you to slow down and fatigue. 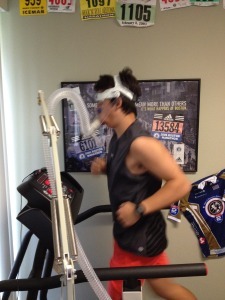 To begin our experiment, we had both guys undergo a lactate threshold test in the lab. The first step was an EKG. After that came back normal they hopped on the bikes which were on a Computrainer for a 10 minute warmup. Looking at the data, there’s a couple interesting things that stand out. The first is in regards to heart rate. You can test LTHR using TrainerRoad, which sometime leads to confusion due to the uniqueness and plethora of variables that affect this value from athlete to athlete. In this case, we see that Reid reached a significantly higher max heart rate despite putting out less power. While this can be attributed to many things, including current fitness level, recovery, amount of sleep they got the night before, diet, etc. it’s important to remember that heart rate cannot be looked at like power. More watts are always good, but a higher heart rate does not mean more power. Even more, sometimes LTHR can decrease as you go through a training plan and become more fit, even though FTP is increasing. Another interesting thing the lab test pointed out was in regards to the types of muscle fibers both Reid and Chad have. As endurance athletes, it’s safe to say both of them have a good amount of slow twitch fibers. These are the red, oxygen-dense muscle fibers that function aerobically. However, notice how high Chad’s lactate shot up once he reached threshold. This large and rapid accumulation shows that he has a great deal of fast twitch fibers as well. These are white, anaerobic fibers that are utilized for things like weight lifting or sprinting. These fibers are also big lactate producers, so as soon as Chad went anaerobic with his effort, these fibers were recruited and the large lactate value we see here was produced. By understanding this, both Reid and Chad can gear their training and racing to their strengths. For example, these results would lead us to believe that Chad has a pretty mean sprint and ability to really bury himself with an effort much over his FTP. However, due to his amount of fast twitch muscle fibers, if he were to jump right into an ultra-endurance event, he may struggle due to the extra lactate that his body has to remove from his muscles. In order to prepare for an event like this, he’d need to spend a lot of time training in Zone 2 in order to adapt and convert more muscles to slow twitch. Just a few days after the lab testing, both guys jumped on TrainerRoad to do a standard FTP test to compare and contrast the results. 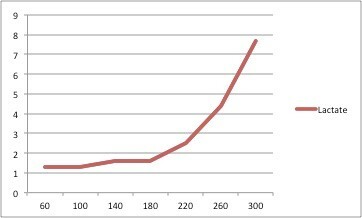 While the lab tests show where the curve regarding lactate production really starts turning upwards, indicating threshold, TR provides the exact number for FTP. 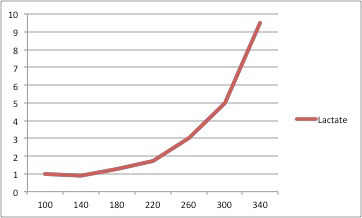 For Both Reid and Chad, these numbers were right in the middle of the steepest part of the curve, indicating lactate is in fact the limiting factor. Reid’s plot shows the greatest slope at approx. 260 watts, and his FTP was 265. Chad’s graph shows the greatest slope at 315 watts and his FTP was 322. The more you know and understand about your fitness, the better you can fine tune and perfect it. My running shoes are slipped on and the upcoming process was explained. I was asked about my 10K time, about 48 minutes these days, not my best work, but OK. We were going to be starting the treadmill at 3 MPH and every 4 minutes the speed would be increased by .4 MPH,. A dab of blood would be taken from my ear each time to measure lactate and then the test would be finished when my “respiratory quotient”, RQ, numbers were over .90 for at least two rounds of the 4 minutes. Understanding the process, I stood up, got my ear pricked (didn’t even feel it, nothing to be afraid of, and I am TERRIFIED of needles) and walked onto the treadmill, ready for the testing. I was donned with a sweet oxygen mask and a mouthpiece that fit under my lips, leaving just enough room to drool, which I did a TON of. We adjusted my sweet oxygen helmet, plugged my nose for oxygen exertion consistency, ensuring I was only breathing through my mouth, a dab of blood was taken from my ear to test lactate and we started. We quickly made it through 3 rounds, the third of which was this really awkward run/walk, making me look as if I had one leg longer than the other, but after four minutes we made it to a slow jog and we were off to the races. Getting used to breathing only through my nose was tough, but I got used to it as I adjusted to each of the speed increases, hopping off each time to get the blood drawn from my ear, again measuring my lactate. The running was easy, at a nice comfortable pace, attainable and not super challenging. The most challenging piece of all of this, beyond the drool like a bull dog, was breathing only through my mouth as the pace increased. The four minute rounds were always the same: blood from ear, increased speed by .4 MPH. As we started to get faster, my numbers would increase, I would near the number that was our goal, settle into my pace, and the number would drop, meaning simply that I would need to run a few more of the 4 minute rounds (and that I am kind of an efficient little machine). About 45 minutes into the test, my numbers stayed consistently above the goal and we were finished with the test, ending at a 7:30 pace, which was somewhat difficult only breathing through my mouth. We were through, my results were locked into the computer, and Julie politely told me I was a heck of a lot more efficient than I thought I was. 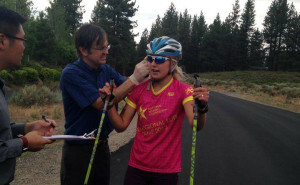 It seemed to end as soon as it began, and it was time for Julie and her team to formulate the numbers for the athlete to understand. A couple of weeks ago we had the opportunity to bring our U18 athletes down to the Silver Sage Sports and Fitness Lab for VO2 max testing. While it was certainly fun get VO2 values for our athletes, there is a lot of feedback from these tests that we can use as coaches. 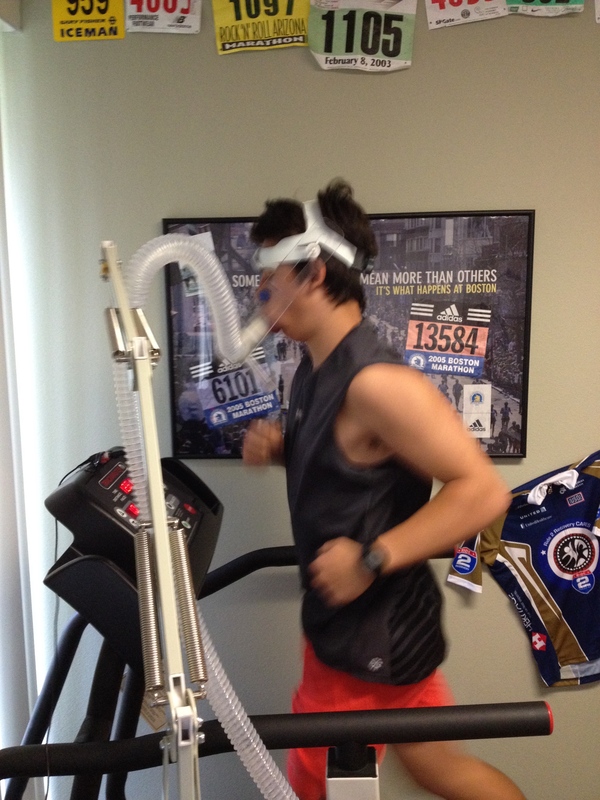 While VO2 max is trainable, more so at this age, we are really interested in a couple of other pieces. The first is the purely mental challenge of pushing yourself hard on a treadmill indoors. One of the great joys of endurance sports is being outside and having the scenery flash by in a blur. The treadmill clearly takes that away, and with no finish lines in sight, it becomes a mental battle to see how long you can stay on; how much steeper can the treadmill get? For our purposes what we really like to see is efficiency. What that means from an endurance perspective is how close is an athletes’ anaerobic threshold to their VO2 max? The closer those values are, the more efficient our athletes’ “engines” are, and more importantly a good indicator that they are responding well to the training plan. If not, we need to reevaluate what that athlete might need. 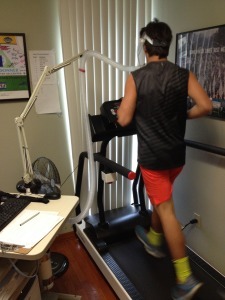 We can also glean data from the test results to determine the proper training zones for individuals. This helps us as coaches because we can individualize training zones and plans in order to pinpoint strengths and areas for improvements. While we always want to improve on our weaknesses, we also need to remind ourselves to maintain our strengths. As competitors, our athletes are often seeking out every opportunity to improve. 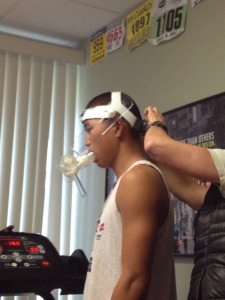 The VO2 testing showed a path to improvement but also reminded us of our strengths. Our training is on the right track. We saw that with the efficiency of our athletes’ respective “engines” and also with their mental tenacity. With a few months until our major championship event, we still have time to make those small improvements and get even stronger.